Pieces of Jacob Haish's life can be found scattered throughout the county...even in a DeKalb warehouse. Jim Hovis, of DeKalb, is a collector of various historical and unique items, and he is the owner of this fountain, now deconstructed, which he says was once on the property of Jacob Haish's mansion. Hovis purchased the fountain from the auction of a home that once sat at 315 N. Third St. in DeKalb. Hovis said he was unsure of how the fountain came to the Third Street home, other than its proximity to Haish's former mansion. The auction was for the house and its contents, which Hovis purchased. Hovis said he put a lot of money into the Third Street home to try to restore it, only to find out it could not be saved. Hovis then sold the house so the property could be used for the expansion of the library: the DeKalb Public Library, or as some know it, the Haish Memorial Library. 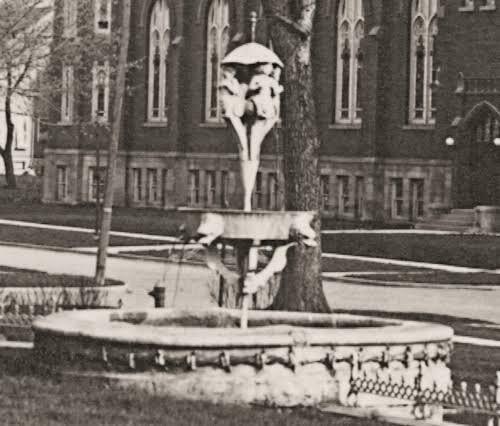 The fountain's pieces currently sit in a DeKalb warehouse, but Hovis said he is interested in donating it to the library to be a part of its previous owner's legacy. The picture below shows the fountain in use at Jacob Haish's home. The image is part of a postcard that featured the First Evangelical Lutheran Church. love my dad's passion for saving things most would discard.